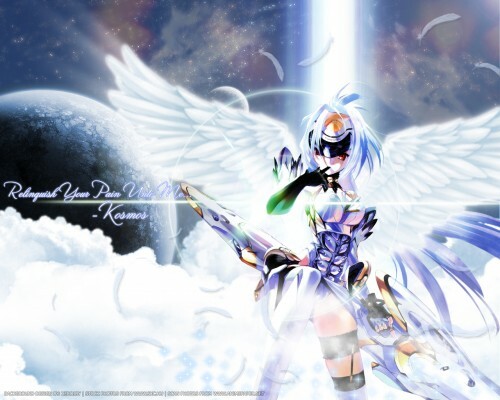 Minitokyo »	Xenosaga Wallpapers » Xenosaga Wallpaper: Relinquish_Your_Pain_Unto_Me..
a wallie of the most beautiful female android(i think). the bg is composed of planets, starfield and clouds.and as for the character is the angel wing. well seing this wallpaper kinda reminds me of the ending of the 1st episode. first, the clouds are composed of my stock photos of clouds. third is the star field is just a noise effects and change the levels to brighten the stars and for the space dust is just a distored clouds and colorize it. for the character, the scan is really dirty so i cleaned it up a little bit, and for the wing.. umm actually its a brush but the problem is the brush size is only 140px so i made some adjustments to it, i redraw some parts of it and add a glow and radical blur to it. well this conludes this wallpaper. the poeple in session zero in animepaper.net for the comments and links. i love everything! But the feathers to me seem a little fake, but other than that great job! I CAN FAV AGAIN!!! YES THIS GOES INTO MY FAV BIN!!!! The scan is amazing ! Great job ! ~ fav ! this wallpaper is very beautiful. very good job. thanks for sharing. wow.....very very beautiful!!! and yes lol she is the most prettiest female android i've ever seen! but that background.....dear lord its gorgeous! you did an awesome job on this! i love love love it! Great wallpaper :D i like the scan and the background is also very nice. Nice background, and I like the clouds. Gotta love it. thanks too..for sharing with us! Need download and add to favourites..
Oh my god this is the same one I got from anime paper. But this couldn't be you could it? the wallpaper looks nice, the chara is pretty and i like the effects you made. the background looks great, it's a good scene. Really a cool wallpaper. You surely took a reall beautiful scan and the bg fits perfectly and simply looks awsome. I love the wings. Did you make them yourself? very pretty!! baclground looks weel done and the android is cool too!! you did a great job!! keep it up! I hope you don't mind that I linked your wall in the Xenogears-Xenosaga group , I wanted to share the beauty of your wall with everyone in the group. Quote by Kougaxgirlwow.....very very beautiful!!! and yes lol she is the most prettiest female android i've ever seen! but that background.....dear lord its gorgeous! you did an awesome job on this! i love love love it! This has to be one of thee best wallpaper of kos-mos. I think that says it all. woow nice walll! i loove the bg! and kosmos is my fave charater in xs!